By Kelly Raber, D. SC. This book is filled with scientific research about hydrogen and its application for the human body. (Not to be confused with hydrogen peroxide. 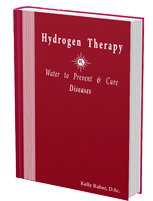 )This book shows in detail how hydrogen separated from oxygen in the water molecule can be used to cure, prevent, and mitigate diseases! Writen by Kelly Raber, D.Sc. Note: Purchase button will take you to a retail site, BioAnue Health Products LLC, to process your order. This book is filled with scientific research about hydrogen and its application for the human body. About the Author: Kelly Raber, D. Sc., holds a doctorate in science and is not a medical doctor. He has formulated 100’s of herbal nutraceuticals for numerous aspects of the body. He believed in sharing his knowledge with everyday people so that they could use his formularies to heal themselves the way God had intended. His dietary supplement formulations have improved cardiovascular health, neurological health, and endocrine health. His formularies reversed diabetes as well as cancer. He has written various articles over the years about natural health and has spoken at different conferences outside the USA that explored the uses of traditional medicines. Many may remember that Dr. Raber’s free speech was taken away by Federal Judge Marc. T. Treadwell in July 2014. All of Dr. Raber’s free online articles were removed from www.tumorx.com. Judge Treadwell threatened to order the destruction of all of BioAnue Labs dietary supplements (formulated by Dr. Raber) if www.tumox.com still contained articles about health on a certain day in July 2014. Despite the timely removal of the articles, BioAnue Labs was nonetheless forced to stop selling our supplements based upon the Judge’s ruling that Dr. Raber’s writings had transformed our products into “drugs by definition.” We are still being punished for our association with Dr. Raber. The Department of Justice will not reply to our letters.